The very first EFPM was a fact. The date was chosen because of the EFE in Landgraaf, which was Sunday september 11. Of course this was a ideal combination for all the Pumadrivers throughout Europe. The beautiful campsite ‘de Bron’ in Valkenburg a/d Geul was chosen to be the location, because it’s only a 15 minute drive to Landgraaf. The campsite is still the place-to-be! During the first EFPM we had 37 Puma’s from Holland, Belgium and Germany. On the program were a small tombola and a Show & Shine contest. We even had 3 stands. The demonstration of the 540hp 4×4 Rally Puma was the highlight of the first EFPM. The second edition EFPM, again together with the EFE in Landgraaf. Pumadrivers were welcome at the campsite on Friday, just like the year before. 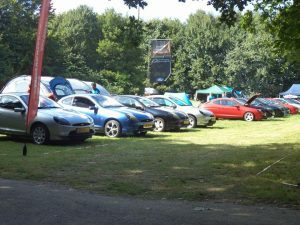 Saturday was the meeting, Sunday we drove together in line to Landgraaf. 56 Puma’s from the Netherlands, Belgium, Germany, France and Switzerland made the meeting to be a real European meeting. Just like the first year there were the tombola and the Show & Shine. This was also the first year of the air-rifle contest and BBQ, which were well appreciated. We also had perfect weather. Our third EFPM. Preparing the site for the meeting bega non Thursday. Previous years there was enough time to start Friday, the First time even Friday in the afternoon. Friday is, from this year, the day when a lot of Puma’s arrive at the campsite. This year we had 64 Puma’s from 6 different countries. We even had a UK visitor. Tombola, Show & Shine, 5 sales stands, air-rifle contest and other games made sure there was no chance to be bored. We also organized the BBQ this year, which, from this year on, is a permanent feature of the EFPM. The fourth meeting in 2008 is known to be the mud-meeting. This was the first year at a different location at the campsite because the terrain became too small, and because there were some campers who had permanent spots at our site. The fifth EFPM. Our first lustrum. Especially for the anniversary, all the puma’s got a DVD with pictures of previous years, and a beautiful Pumadrivers pen, in our own red color. Because we were told that the EFE wouldn’t be at Landgraaf anymore, we took the entire weekend for our EFPM. Friday was only for arrival, Saturday the “real” meeting with tombola and BBQ, and Sunday the awards. This is also the first year the entrance was made Wednesday, the rest of the terrain Thursday so we had Friday for the final straws. This year 6 tents made the heart of the meeting. It was also the first year we didn’t have any stands, but we did create FRP lane, where we proudly presented our three FRP Puma’s. HART Ralley Team was a special guest this year, who came to show their brutal Rally Puma. Despite of the weather and anniversary, we “only” had 69 Puma’s this year. Fortunately we took Sunday at our meeting, which made sure we have a nice “status” inside the Puma community. The sixth edition. A true European meeting. 73 Puma’s from 10 different countries. Visitors from The Netherlands, Germany, Belgium, France and Switzerland were there previous years. This year we also had visitors from Austria, Hungary, Czech Republic and Slovakia.That one drove 1500 km to attend the meeting! Another record was at FRP lane. There we had 4 FRP’s from three different countries, The Netherlands, Belgium and Germany. This years award ceremony was at 14.00, which made Sunday one of the meeting days. 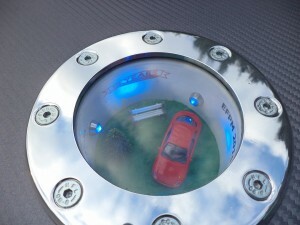 Just like last years we had a lot of beautiful Tombola prizes, show & shine cups, activities and a nice BBQ. The subscription got extended by webcam, and a picture was made of every puma attending the meeting. But the biggest event this year was our work platform, sponsored by ACW Softline, which took visitors 35m up in the air. This gave a very nice view over the hills of Limburg, and an even better view over all the Puma’s at the meeting. During our 7th EFPM we had amazing weather, with the exception of sundaymorning. Even the night temperature was perfect. We had a total of 70 Puma’s from the Netherlands, Germany, Belgium, France, Austria and Italy. Again a new record this year, 5 FRP’s, even one from France, which we never had before. The subscription had a little extra this year, a screen with all the meeting statistics. We had a lot of Puma’s and a lot of fun. The people at the meeting make the EFPM to be such an success.. At the shooting range we had three new items this year, for example a moving deer. More difficult but more fun. We also had darts, pitbox game and table-tennis (without competition). At the show & shine we had 3 extra cups because we added a category between standard and tuned. During the ceremony all the winners got a plaque with picture, which was a great success.. Tombola and BBQ were also a very big success.. All visitors got, upon entering, a black model mini Puma, which were sponsored by Ford Germany. The eighth edition was the one with the best weather of all previous EFPM’s. We “only” got 56 puma’s from Germany, Belgium, France and the Netherlands. The low number had no influence on the success of the meeting, because it was a lot of fun. This year was the first version of digital voting. People could cast their votes by smart phone. All activities were well visited, and again we added a category to the show & shine. The tombola is still a very big feature of the meeting. The weather, fun and lot of gasoline talks made another superb meeting. We are hoping to be better visited next year. We had perfect weather during the preparations of the ninth EFPM. The pre-subscriptions showed that we would approximately have the same amount of Puma’s like last year. Because of that we put the tents on the center field, just like 2010. This way, everything was closer to eachother. This appeared to be the right choice. With a total of 53 Puma’s from the Netherlands, Germany, Switzerland and France, we did have a nice amount, especially when the number of Puma’s is dropping. This was the first year we had a little tour in and around Valkenburg. The BBQ had a different setting this year, we took a new supplier. This appeared to be a good choice. The M&R shooting contest and Tuninghaus Grand Prix were very successful, just like the Pumadrivers Tombola. Unfortunately, we did not have the nice weather during the meeting like we had during construction. The temperature was nice, but it rained a lot. The night from Saturday to Sunday we had so much rain, several tents gave to the weight of the water on roof of the tents. By pushing the water of the roof, we managed to keep it dry under our own tents. Sundaymorning the sun came through and the Puma world became okey again. We can look back to a very successful meeting, and we are looking forward to the 10th European Ford Puma Meeting next year. Our tenth edition, who would have thought! Friday we already had 44 Puma’s which was a new record! We only got Puma’s from Germany and the Netherlands this year. Saturday we got 11 more, also one from Belgium. We had a total of 55 Puma’s, all gathered on the central meeting terrain. We kept the same layout as the year before, just like we kept the big BBQ, M&R Autoparts Shooting contest, Tuninghaus Grand Prix and of course the very successful tombola! Why change what’s good right? We are able to look back to a very successful anniversary. As a surpise to our visitors we had 60 red wishing balloons, which we sent on their way together. It was beautiful to see, truly worthy for an anniversary. Luckily the weather was on our side the entire weekend. by FlORiDa Fraktion, family Wight and Puma Team Europe. Also, all the nice responses on several forums and Facebook told us the EFPM is very much appriciated. Which gives us reason enought to continue organising. We hope to see you next year. We are ready for another anniversary! The first meeting after our 10th anniversary. From Wednesday on we started with the preparation of the camping site, all went well. In total there were 51 Pumas at the meet, a respectable number again. It’s always great to see such a big number of Puma gathering in one place. The weather wasn’t that great but it did no harm to the fun all visitors had during the weekend. Unfortunately due to the weather, we had to cancel a spectacular activity. You have to wait till next year. 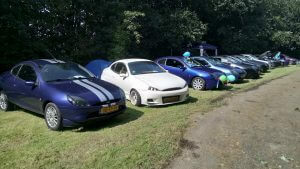 Again it was a perfect Ford Puma meeting, with a lot of fun. EFPM number 12 already, Puma tradition, Puma culture. From Wednesday on we started with the preparation of the camping site. The first visitors arived on Wednesday too and gave us a hand . Remarkable was the fact that there were only 23 Pumas on Friday 26 came Saturday so 49 Pumas from Germany and the Netherlands attended at the meet. New this year was the bouncer fort he little Puma drivers as well as the ‚big once too. Also new was the ‚moving target‘ at the airschooting contest. The weather was perfect untill Sunday at noon a shower with a lot of rain hit us. Thank god most of the Pumas were on there way home already. It was once again a very nice Puma meeting, see you next year. EFPM number 13 definitely wasn’t bad luck on the contrary. The week before the meeting is was still summer, great weather. Unfortunately the rain came from Wednesday on, the day we start building up our meeting. So much rain fell that we had to decide to park all Puma around the hard shoulder to prevent it became a big mud bath like we had back in 2008. This year had planned a short roundtrip once again, and for the first time (in cooperation with ACW Softline) we rented Sumo wrestling suites. Great fun to do. For the first time since 2012 the number of Pumas attending at our meet increased. Over the last years the numbers went down every year. Great to see we had 56 ! Pumas from The Netherlands, Germany an (2 Pumas) Hungary. It was, once more, a great Puma meeting with lots of fun for everyone. We are already looking forward to the 2018 meet. During EFPM number 14 we had perfect meeting weather. Because of the great weather we could park all the Pumas together again like we used to do. It still looks amazing, all those great little Puma’s together at our meet. Remarkable was that on Thursday already 7 Pumas found their way to the camping side. We never ever had so much Pumas on Thursday already. 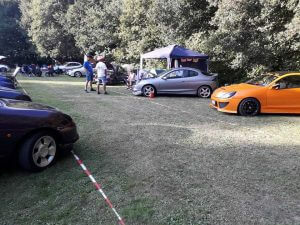 Because of the seven Pumas on Thursday, it was disappointing that ‘only’ 43 Pumas actually visit this year’s European Ford Puma Meeting. Only 2005 we had les Pumas at our EFPM. Remarkable is the number of non-Pumas who come to the Puma meeting. Most are former Puma drivers who still enjoy to be with us. But never the les it was a great meeting once again. With Pumas from the Netherlands, Germany and Italy. At the meeting reports you can find the reports with a lot of beautiful pictures and movies.